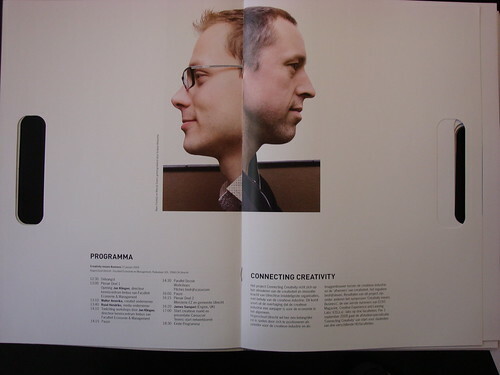 Some time ago Marcel and myself were interviewed for the 4th edition of the design magazine “ECHT” (authentic). For our trustworthy English readers we translated the whole interview to English! Scroll down to read the Dutch version. 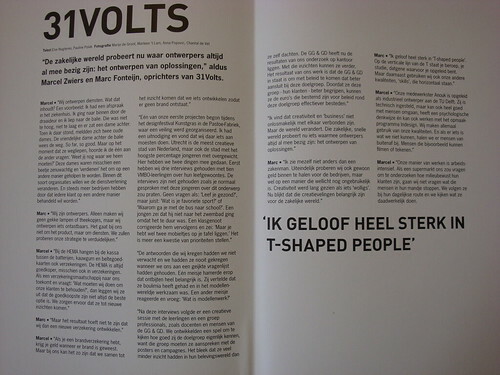 “The business world is now trying what designers have always been doing: the design of solutions” said Marcel Zwiers and Marc Fonteijn, founders of 31Volts. Marcel: “We design services. What does it mean? For example: I had an appointment at the hospital. I went inside through the revolving door and I walked to the desk. It was not too high, not low and there was a lady behind it. When I was standing there, two elder ladies joined me at the desk. The friendly lady behind the desk pointed the way. So far, so good. But when the elder ladies walked away from the desk, I heard one of them asking the other : “Do you know where we need to go?” These ladies were probably a bit nervous and deserved to be helped differently. Within this kind of organizations we would like to change the approach to the service. And more and more companies would realize that they need to improve their approach to customer service. “One of our first projects started at the design festival Kunstgras in the Pastoe-Factory, where an design-auction was organized. I got the invitation and though the we needed to do something for the event. Utrecht is the most creative city of The Netherlands, but it is also the city with the highest percentage of teenagers with obesity. “The interviews were followed by an creative sessions with students and professionals like teachers and people from Utrecht health service (GG&GD). We developed a game in order to see how good the professionals know the true life of the kids. It turned out that they had way less insights in that world then they thought. The GG&GD got all the insights at their desk. With the gained insights they can work further. The results of our work means that GG&GD should be able to create better government policy that connects with the kids groups. Through a better understanding of their target group the GG&GD can allocate their budget for the target group in more effective way. Marcel: “Our way of working is labor intensive. If a supermarket would ask us to examine if their customers are environmentally conscious, we wouldn’t ask these people what they by. We would follow them in their daily routine and we see what they actually do. And here’s the Dutch version. “De zakelijke wereld probeert nu waar ontwerpers altijd al mee bezig zijn: het ontwerpen van oplossingen,” aldus Marcel Zwiers en Marc Fonteijn, oprichters van 31Volts. Marcel – “Bij de HEMA hangen bij de kassa tussen de batterijen, kauwgum en beltegoed-kaarten ook verzekeringen. De HEMA is altijd goedkoper, misschien ook in verzekeringen. “Ik vind dat creativiteit en ‘business’ niet onlosmakelijk met elkaar verbonden zijn. om te onderzoeken hoe milieubewust hun klanten zijn, gaan wij niet vragen wat die mensen in hun mandje stoppen. We volgen ze bij hun dagelijkse route en we kijken wat ze daadwerkelijk doen.